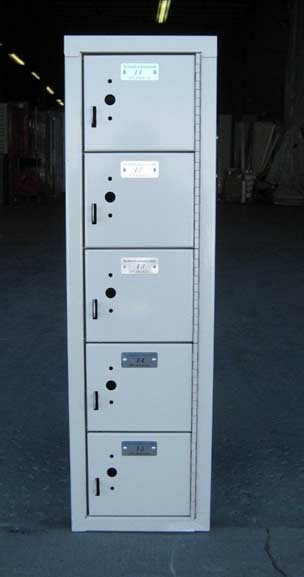 These HDV Gym Lockers are available on www.buyusedlockers.com where they have a huge selection to choose from if we need additional supplies. We have an HDV gym locker for you, no matter where or why you need it! We offer them in 21 color choices and unlimited sizes with short lead times. These are constructed with 14 Gauge diamond perforated doors, 16 Gauge diamond perforated sides, and solid 16 Gauge bodies making them some of the strongest available with great air circulation which also enables easy visual inspection of stored items! Perfect for equipment of football players, police officers or fire fighters. The ultimate in durability and ventilation, they are ideal for applications that require a high degree of ventilation and strength such as school or team rooms, weight lifting facilities, gyms, etc. Also available as single tier, double tier, or multiple tier layouts in any size to meet your needs and design layouts.